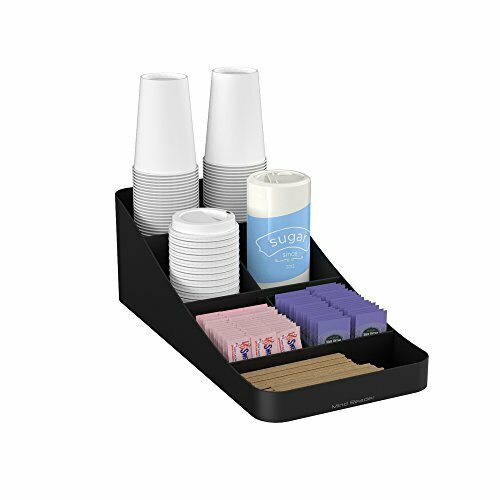 The Organizer will hold all of your serving essentials, including sugar, cups, stirrers, napkins, creamers and even coffee pods. 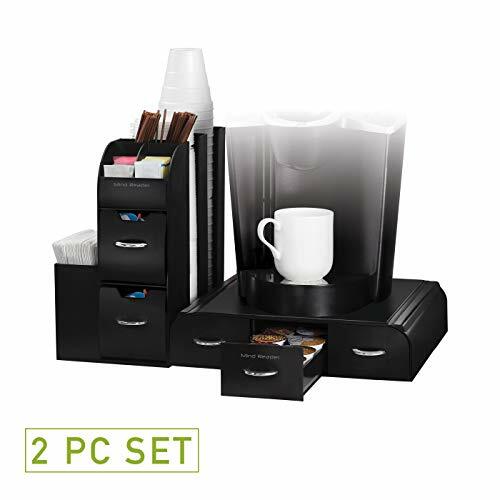 This 2 pc set creates an instant coffee station both at home and work. 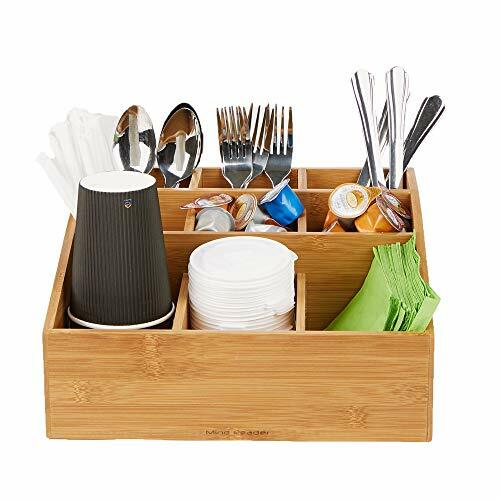 ECO-FRIENDLY - Made of Bamboo for an eco-friendly look and feel to your break room. 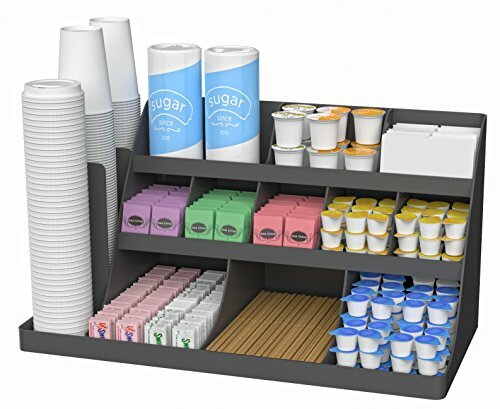 3-TIER - 3 Storage compartments for all of your serving essentials including sugar, tea, stirrers, napkins, coffee and much more. STURDY - Bottom rubber grippers to keep unit in place and avoid slippage. EASY ACCESS - Clear acrylic bin faces provide for visibility to all of your condiments. NINE COMPARTMENTS - Perfect for storing creamer,sugar, sweetener, stirrers, K-cups, coffee lids, forks, spoons, napkins and much more. 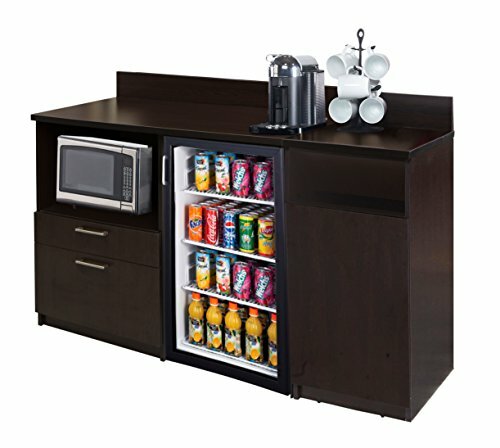 EASY ACCESS - Open storage calls for easily accessible condiments and coffee items. Everything you want and need right at your fingertips within arms reach. 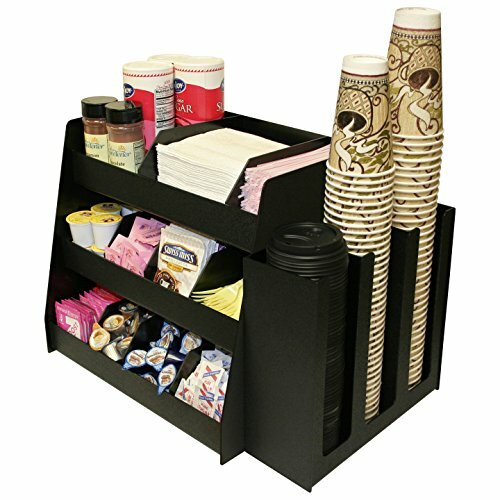 2 Piece Combo Coffee Condiment Organizer And A 3 Column Cup and Lid Holder...for One Great Price ! A Very Professional Coffee Program Presentation. 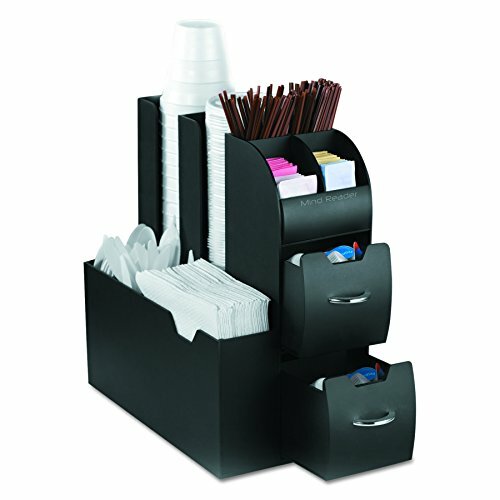 Comes with 6 Extra Tall Shelf Dividers that are Movable & Removable. Proudly Made in the USA! by PPM. Organizer now has 8 Extra tall dividers, making up to 11 compartments. These 2 units will make for a very professional presentation as well. Made of break-resistant hi-impact textured black ABS plastic that's also made in the USA! 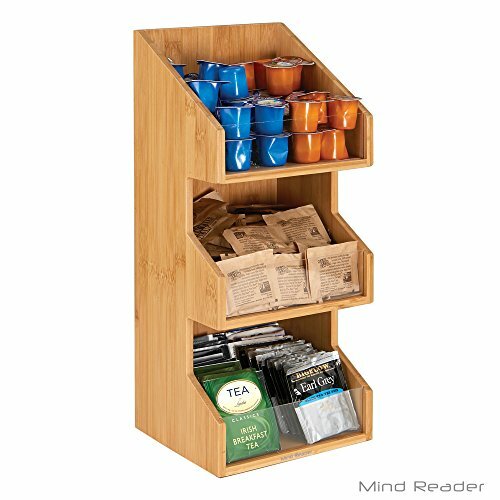 The 8 extra tall dividers that fit on any of the shelves, letting you make 11 compartments! and are Movable & Removable which allows you to make your own sized compartments. Dividers are not glued in place. 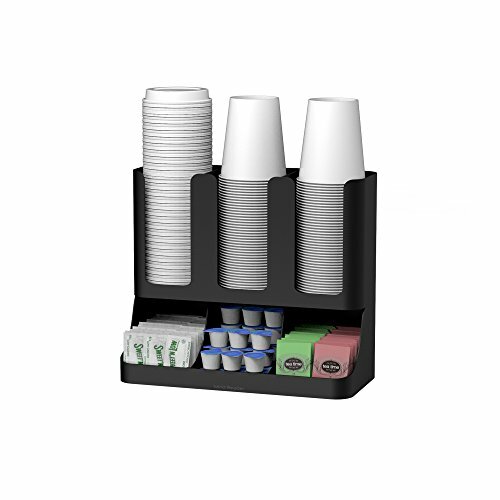 Loaded product keeps them in place and tall dividers let you hold more product!. Great for lunch rooms too! 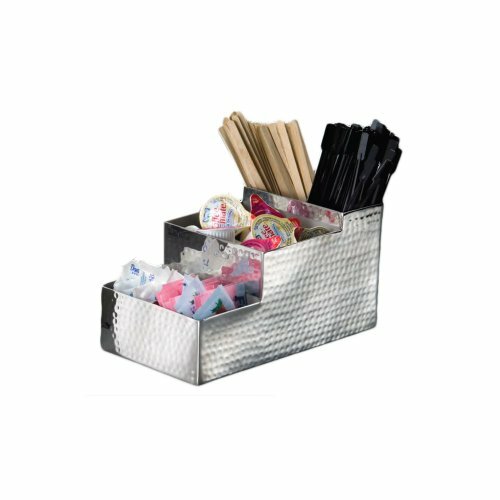 for organizing utensils, paper plates and prepacked condiments. 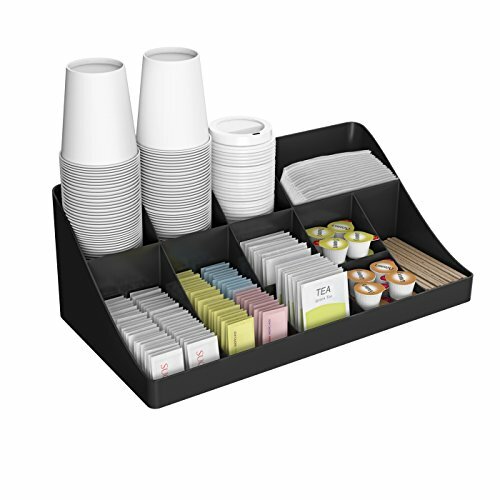 Cup/Lid Holders can be used on either side (as shown) or separately. Both units have non-skid tabs on the bottom so they won't slide on your counter. Only 20 1/2" wide of counter space is needed for both pieces combined as shown. 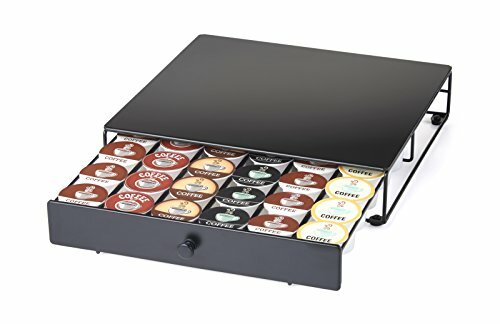 A perfect combo to organize your coffee program, whether it be in an office, cafe, lobby, c-store or at home! To SEE ALL our Products...just click above on...SOLD by PPM SALES ! 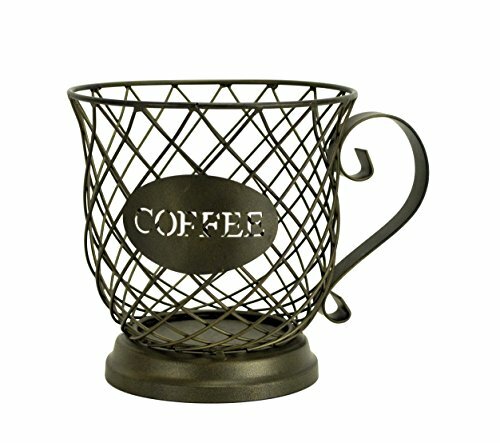 A thoughtful housewarming gift,; can also be used to hold creamers, tea, fruit, utensils, even as a mail basket - be creative! 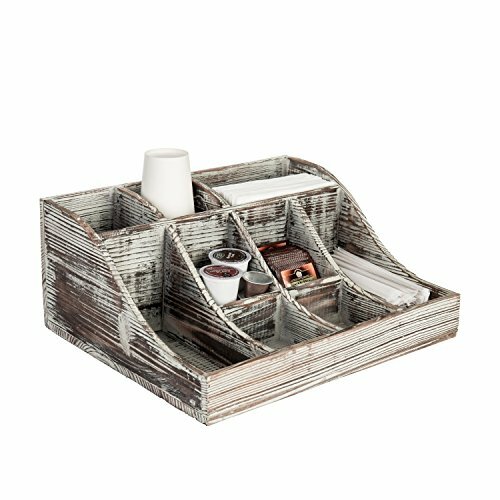 Rustic design condiment storage and organizer with a brown torched wood finish. Features 11 various sized compartments for tea, cups (up to 8 ounce) , creamers, sugars, napkins or straws. 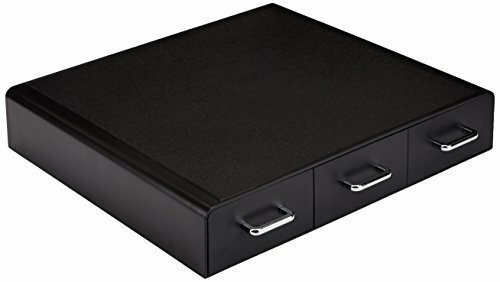 Perfect for office break rooms, kitchen storage or even as a makeup caddy. **Official MyGift product** Condiments and accessories not included. Approximate Dimensions (in inches): 6.5 H X 15.5 W X 12.75 D, Suitable for cups up to 8 oz.